A crate is such a great tool for so many reasons, so let’s take a look at these 5 easy steps to crate training a new puppy. 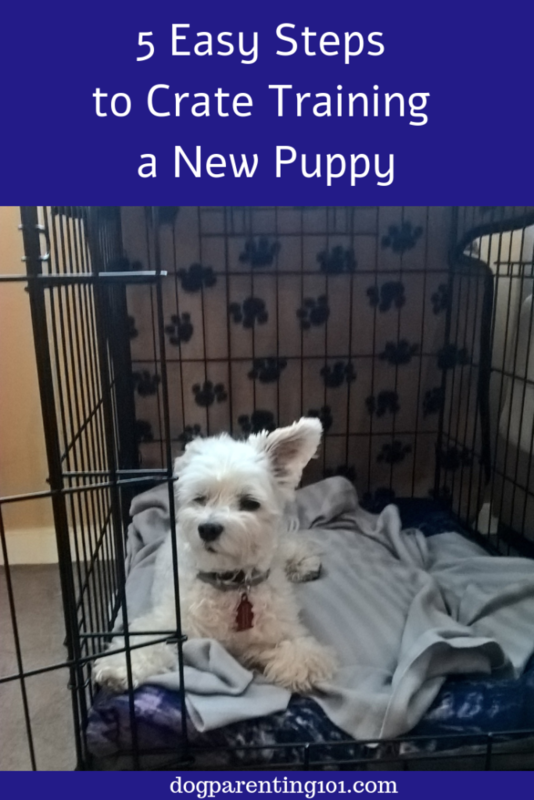 How long will it take for my puppy to love his crate? I’m going to say “it takes as long as it takes” even though I realise you want a specific measure of time. Every dog is different – some will walk right in curl up and go to sleep, while others will take days or longer. Don’t rush training because it can backfire, meaning you will sabotage any progress you’ve made. Take it slowly and pay attention to your dog’s comfort level. Don’t move on to the next step until your pup is totally comfortable. If he’s anxious during any stage, stop what you’re doing and go back to the point in the training when he was comfortable and start again from there. Having said all this it’s also possible your dog is so easy going you’ll make it all the way to step four in no time! Before you even go near the crate have some delicious treats handy. It’s a good idea to save his favourites for times when you really need his attention…like during training!! Not food motivated? No problem. A favourite toy or lots of praise work well too! This is super important but not listed as a “step” because it can go with step one or two. You don’t want to physically “put” your puppy into the crate or nudge him in, it’s best for him to walk in on his own, on your cue. How you ask? Simply choose a word or phrase –“crate” “in your crate” “crate time” and use it whenever he walks into the crate during training. You will get to the point where simply saying the cue will get him in there under his own steam! Step One – Pleased to meet you! 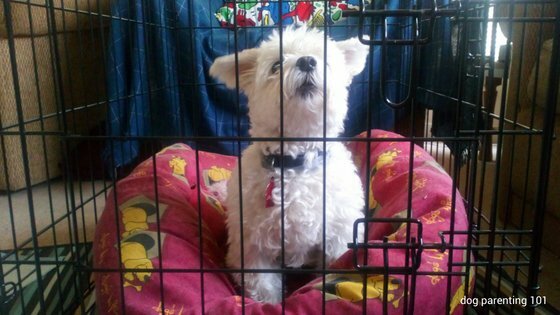 The first step is all about helping your dog feel comfortable around the crate. Sit on the floor near the crate, open the door and place a treat or toy just inside right at the front. You want your dog to be able to reach it without having to go in at all. When he eats the treat or plays with the toy praise him. Each time you will move the treat/toy further until it’s at the back of the crate and he has to go all the way in to get it. You do not have to get the treat all the way to the back in one session, and as a matter of fact you’ll be more successful when you take it slowly. If you’re here that means your puppy is comfortable walking all the way to the back of the crate to grab a treat or a favourite toy. If you’re not completely convinced, stop right there and go back to step one. It’s not a race or a competition so slow it down. Great, you’re back and ready for the next step which is feeding him some meals in the crate. Leaving the door(s) open, put the bowl in the back and let him eat. It’s as simple as that! Before you start this step I recommend you take your pup out for a nice long walk or a play a game of fetch in the backyard. It will help release some pent up energy so he’s more relaxed, and you know he won’t start whining because he has to pee or poop! If you want to distract him a bit how about a treat filled toy in the crate? He’ll be so busy he may not notice the door is closed! Close the door just a bit then open it, close it a tiny bit more then open it and so on. You’re working towards the point where you can close the door and leave it closed for a few minutes, with you sitting nearby. Now that your dog is happily sitting in his crate with the door closed, you want to be able to walk away, and yes that means out of his sight. It’s important not to say anything, look at him or make a fuss when you close the door and leave and when you return. The first time you do this you will be out of his sight for just one second before you go back and he can see you. The next time two seconds then go back into the room and so on. You will continue this until you can be out of his sight for 30 minutes. The reason we start off with one second then two? You won’t be gone long enough for him to start whining or barking. Why is that important you ask? Because if he starts barking and you come back in, you are teaching him he gets what he wants when he barks, and that’s a road you don’t want to go down. Congratulations and well done for reaching this point. It doesn’t matter how long it’s taken you, what does matter is he’s comfortable in his crate with the door closed and he can handle not seeing you for about a half hour. Now it’s time to leave the house, but take him out for a long walk to tire him out before you do! Remember not to say anything or make a fuss when you close the door and leave the room. Also start with being out for very short periods of time then staying away longer. Very young puppies shouldn’t be left alone in a crate longer than a couple of hours, and no dog, no matter how old, should ever be left more than 4 or 5 hours. I know how overwhelming this might seem to you, so much so you may be feeling you’ll never figure out how to crate train your puppy. Perfectly understandable but it’s like that with anything new. Take your time and read the steps as often as you need and you’ll be just fine. Ready to schedule a virtual training session with me? Great let’s get started!! Simply fill in the contact form with your time zone and what you need help with, and I’ll be in touch to set up an appointment.